All acts of worship need two fundamental ingredients: legal validity and inward sincerity. Zakat is like this too. Not knowing how and when to give zakat could mean that years pass by a person with this central pillar of Islam unfulfilled. Not knowing why we give zakat can make it feel like a burden for the giver. Someone like this may be sincere when giving, but it is not like the sincerity of one who appreciates the wisdom and benefits behind this act of worship and then gives. This course is essential to give life to your zakat. Imagine a garden with many beautiful plants and flowers. Over time, weeds start to grow among them, and eventually, they take over. It is essential to remove the weeds in order for the flowers and plants to thrive. This is the original meaning of the word zakat. Zakat is a means of purifying oneself and one’s wealth in a manner which promotes growth. This growth is for the individual, those who receive zakat, entire communities, and potentially then entire Umma. Having said that, knowing its greater wisdom is not enough. We are obliged to pay zakat if we meet the right conditions. Knowing this takes study – especially in our times when financial matters are much more complicated than they were in the past. 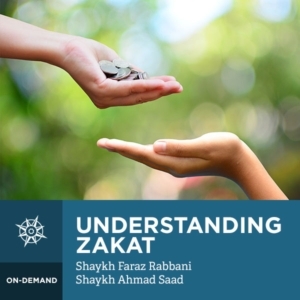 This excellent course covers all that one needs to know, from the wisdom of zakat, to what it is, who must give it, who can receive it, who it should not be given to and more. Shaykh Ahmad Saad al-Azhari and Shaykh Faraz Rabbani beautifully expound the letter and spirit of the law to make this an act of worship which results in spiritual growth and one’s zakat to thrive.